Government will meet commitments to protect budgets for key public services, defence and overseas aid. The “triple lock”, linking the state pension to the higher of inflation, earnings growth or an increase of 2.5% per annum will be retained until the end of this Parliament. Forecast economic growth of 1.7% in 2018, 2.1% in 2019 and 2020, and 2% in 2021. £2.3bn housing infrastructure fund, to help provide 100,000 new homes in high-demand areas, and £1.4bn to deliver 40,000 extra affordable homes. Fuel duty rise cancelled for seventh year in succession – at a cost of £850m, saving the average car driver £130 and van driver £350 a year. £23bn to be spent on innovation and infrastructure over five years. A ban on upfront fees charged by letting agents in England. The Autumn Statement will be replaced from next year, with Budgets happening in the autumn, and a “Spring Statement” introduced from 2018. The UK has shown remarkable resilience in the wake of its vote to leave the EU. Although the economy is expected to slow, the Office for Budget Responsibility still expects growth to be at least as good as that of Germany and better than both Italy and France. However, Britain is set to face a number of challenges in the next 2-3 years as negotiations around Brexit continue. With other European countries also considering their place in the EU, there is the potential for further political uncertainty. In the face of such headwinds Hammond has taken a prudent approach in his first Statement, providing as much fiscal flexibility as possible. By adopting a frugal stance, he has left himself headroom for any necessary action later. The proposed fiscal mandate gives him scope for £26.5bn more in structural borrowing in 2020-21 than his predecessor was aiming for last March, which is a reasonable war chest with which to fight future economic encounters. One of the main topics highlighted by the Chancellor on Wednesday was a projected increase of approximately 50% in government borrowing over the next five years. With the announcement of increased borrowing, UK Government Bonds fell in response to the deteriorating outlook for public finances and 10-year gilt yields rose from 1.35% in the morning to 1.48% by mid-afternoon, the largest increase in almost a month as investors started selling UK sovereign debt. By market close, yields had drifted back, finishing at 1.45%. 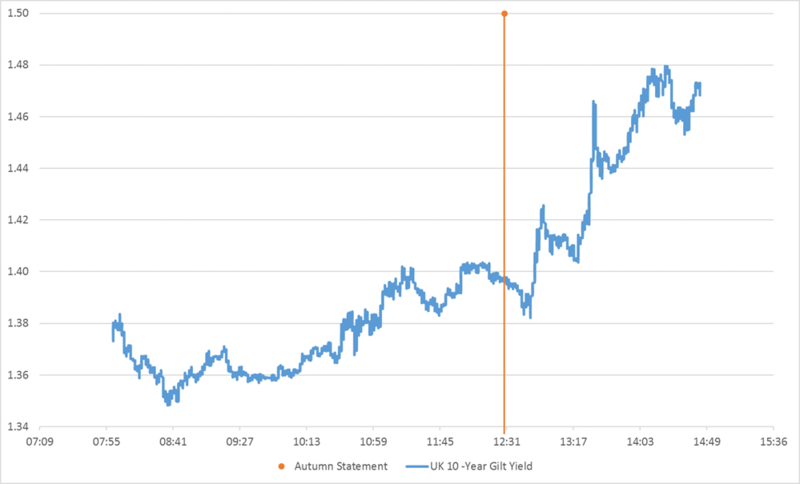 The chart below illustrates the sharp increase in 10-year UK gilt yields on the day the Autumn Statement was released. Rising bond yields can indicate that interest rates are likely to follow suit. While rising interest rates can be unsettling for financial markets they are, inherently, a sign of growing economic prosperity. In addition, one of the quirks of actuarial accountancy is that the value of Defined Benefit or “Final Salary” pension schemes is closely linked to interest rate levels. In the way that pension deficits are calculated, as interest rates rise, the level of the deficit falls. So, firms like British Telecom, British Aerospace and Rolls Royce, with large pensioner bases, have been labouring under ever increasing pension deficits and been required to divert profits away from paying dividends to shareholders in order to build up their pension funds for the benefit of retired employees. As interest rates edge up, these pressures should ease and companies with large final salary pension schemes should find themselves rerated as they are able to allocate a greater proportion of their profits either to reinvest in the business, or pay out by way of a higher dividend. A number of our Portfolio managers have been increasing their holdings in these companies in order to benefit from just such a revaluation, proving that all clouds have a silver lining. In the two weeks leading up to the US election, the market experienced declines for nine consecutive days. However, as the Trump-rally continues, the Dow Jones Industrial Average index hit record highs this week. The blue chip index, which represents the 30 largest, publicly owned companies based in the United States, surpassed the 19,000 mark on Tuesday closing at a record high of 19,083.18 on Wednesday.